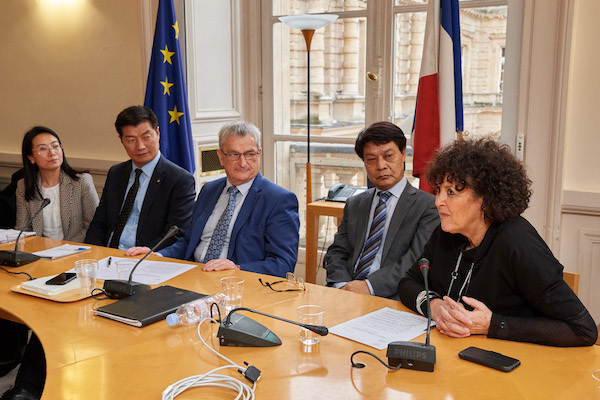 (TibetanReview.net, Jan28, 2018) – President Lobsang Sangay of the Central Tibetan Administration (CTA) has on Jan 25 addressed a panel discussion in the French parliament building which was chaired by Senator Michel Raison. He has also addressed a conference on Middle Way Approach jointly organised by European Members of Parliament Csaba Sogor and Molly Scott at the European Parliament on Jan 24, according to the CTA on its Tibet.net website Jan 27. Those who attended the panel discussion in the French Parliament building were stated to include both Senators and National Assembly members. He has called France the “mother of Middle Way Approach”, given the fact that Tibet’s exiled spiritual leader, the Dalai Lama, had unveiled this proposal in his address to the Europeans Parliament in Strasbourg in 1988, and urged support for it. Under its Middle Way Approaches, the Central Tibetan Administration seeks autonomy, not independence, for an integrated Tibetan territory that is currently divided into or has been made parts of Tibet Autonomous Region, Qinghai Province, Sichuan Province, Gansu Province, and Yunnan Province. Apart from speaking in the European Parliament building conference, President Lobsang Sangay was stated to have testified before the European Parliament’s Subcommittee on Human Rights calling for implementation of internationally defined rights in Tibet.